Well Head Gas engines come equipped with emissions certified fuel systems that can run on a wide range of gaseous fuels. This system can provide emissions certified power from fuels as low as 700 BTU per cubic foot lower heating value. KEM Equipment has combined the power of the GM MEFI ECM and the authority of the Continental Controls GV1 fuel valve into an easy to use wide range fueling system. Changing from natural gas to propane fuel will only take a flip of a switch. The fuel selection switch is mounted to the engine control panel along with the starter switch and engine instrumentation. All KEM WHG Industrial engines come standard with the MVP CAN based control panel. 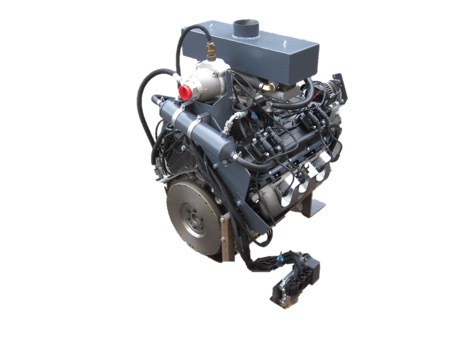 Engine setup and operation is simplified by having one easy to use adjustment. Each turn of the fuel selection switch adjusts a host of ECM calibration parameters, allowing clean reliable running with any supported fuel type. KEM Power WHG engines are based on the same architecture as KEM’s Industrial Stationary engines. Proven reliable components with a fuel system able to meet the needs of Well Head Gas users. 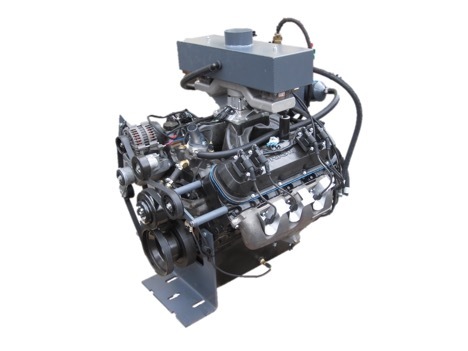 This fuel system is very versatile, and has been tested to meet emissions standards on fuels with energy contents of 700BTU per cubic foot to 2500BTU per cubic foot with the proper fuel select switch setting and fuel pressure. The engine control panel has a fuel selector switch with 5 set points which is where the fuel energy level is selected. This panel mounted switch is the only adjustment on the engine. Set the fuel selector switch to the fuel energy content setting that is closest to the actual value before starting the engine. The MVP display panel will show engine parameters. Observe the coolant temperature on the MVP gauge while the engine is running at idle speed with no load. When it reaches 71°C or 160°F push both the Menu and Enter button at the same time. Now push the menu button until “Engine Parameters” is displayed. Push the up arrow until “BLM Bank A” is displayed. Adjust the fuel selector switch one step at a time until the BLM value is between .88 and 1.12. If the BLM is less than 1, turn the knob to a higher BTU fuel. If the BLM is greater than 1, turn the knob to a lower BTU fuel position. 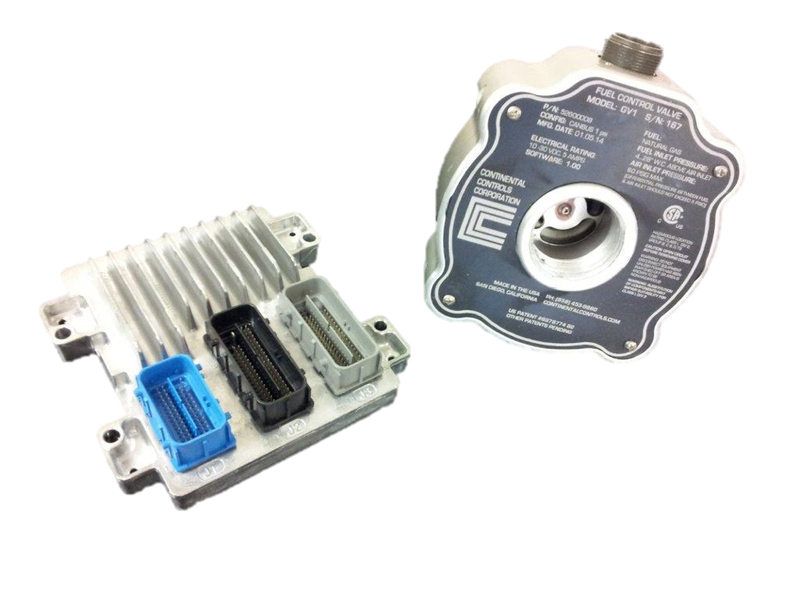 Be sure to use a coalescing filter before the GV1 fuel controller, as liquid ingestion will damage the unit and is not covered under warranty. The supply fuel pressure to the engine can be anywhere between 15′′ H2O and 5PSI as long as the fuel energy density is equivalent to Natural Gas or higher. This supply pressure must be measured on a running/loaded engine to be sure it can maintain that pressure range at any engine condition. The supply line sizing will limit the fuel flow if too small for the engine demand. *Low energy fuel of 700 BTU/ft3 LHV must have a minimum of 45% Methane by volume or meet other requirements, please contact us at 503-692-1098 for details.